Aim: This study investigates the amount of available chlorine and pH of sodium hypochlorite after dilution and the influence of storage temperature, heating, and aging. Materials and Methods: A 5.25% sodium hypochlorite solution was diluted to 2.5%, and free available chlorine (FAC) and pH were measured. This was labeled as the control group. The diluted solution was divided into four groups. The first and second groups were stored at 4°C and room temperature, respectively, and FAC and pH were measured at room temperature at intervals of 30 min, 1, 3, and 6 h. The third and fourth groups were stored at 4°C and room temperature, respectively. Samples were collected at intervals of 30 min, 1, 3, and 6 h after heating to 60°C–70°C, and FAC and pH were measured. An iodometric titration method was used for FAC estimation. pH was measured using a digital pH meter. Data obtained were statistically analyzed. Results: All groups showed depletion in FAC and decrease in pH over time. Available chlorine was utmost in Group III and least in Group II. No statistically significant difference in pH was recorded. Conclusions: Sodium hypochlorite at room temperature should be used within 3 h of dilution. Its shelf life can be enhanced by storing at 4°C. Heating the solution to 60°C–70°C before irrigation is more efficacious. Sodium hypochlorite is the most preferred irrigant in modern endodontic practice owing to its antibacterial, pulp dissolution, and lubricating qualities. It causes biosynthetic alterations in cellular metabolism and phospholipid destruction. Formation of chloramines cause interference in cellular metabolism and degrade lipids and fatty acids in bacteria. Chlorine, a strong antioxidant, is released when in contact with organic tissue, resulting in inhibition of bacterial enzymes by irreversible oxidation of the sulfhydryl group. Therefore, the presence of “available” chlorine is critical for efficacious disinfection. In aqueous solution, the available chlorine is the sum of hypochlorous acid (HOCl –) and hypochlorite ion (OCl –). The available chlorine is measured by the oxidizing capacity of the solution and expressed in terms of the amount of elemental chlorine. Sodium hypochlorite solutions ranging from 0.5% to 5.25% are recommended as endodontic irrigants. Certain studies have concluded that the antimicrobial and tissue-dissolving properties occur faster in higher concentrations, but they also pose the risk of toxicity to vital tissues. 5.25% sodium hypochlorite was efficient in eliminating spores and viruses in addition to the bacteria commonly prevailing in the root canal but posed the risk of toxicity and irritation when forced beyond the root apex., At lower concentrations, the antimicrobial and pulp dissolution properties are lowered. Concentrations of 1% or more are recommended for tissue dissolution and for the purpose of disinfection; the concentration of sodium hypochlorite should be at least 0.5%. However, it has been verified that 0.5% sodium hypochlorite was less irritant but required more time for the dissolution of organic tissues. 5.25% sodium hypochlorite was more potent in dissolving organic tissue, had better antibacterial action, and faster reaction time. In contrast, it was excoriating to the vital tissues, favoring the use of 2.5% concentration of sodium hypochlorite which showed better antimicrobial action with good tissue dissolution time and lesser cytotoxicity. Studies have shown that there was a marked decrease in the microhardness of root dentin after irrigation with 6% sodium hypochlorite than a 2.5% solution. Sodium hypochlorite has deteriorative effects on the biomechanical properties of dentine as it causes degradation of the organic dentine constituents., Thus, 2.5% sodium hypochlorite is recommended for routine root canal treatment procedures. Pure hypochlorite solutions used in endodontics have a pH of 12. Investigations have shown that solutions are least prone to decomposition when the pH is above 11. Below pH 11, the rate of decomposition is dependent on the pH, where it rapidly increases from pH 11 to 7, with the peak rate at pH 7. Hence, the pH of the diluted sodium hypochlorite solution also plays an important role in the stability of the solution. There is a paucity of literature that assesses the free available chlorine (FAC) and pH in sodium hypochlorite postdilution with distilled water, stored at different temperatures, and its efficacy when heated. The aim of the current study was to investigate the variables of storage temperature, the temperature of the solution while working and time on the FAC and pH of 5.25% sodium hypochlorite diluted to 2.5%. A 5.25% sodium hypochlorite unbuffered solution (Medilise Chemicals, Kannur, India) was used. The bottle was obtained within 3 months of manufacture. It was full at the beginning of the study and was opened only during sampling. As the purpose was to obtain a final concentration of 2.5% sodium hypochlorite, 1000 ml of undiluted sodium hypochlorite was mixed with 1100 ml of distilled water. A 25 ml sample of the 2.5% sodium hypochlorite was taken, and the FAC was measured by titration with sodium thiosulfate. The pH was determined using a digital pH meter (Labtronics, Panchkula, Haryana, India). This sample was labeled as the control group. The control group, i.e., 2.5% sodium hypochlorite at 0 h aided comparison of percentage loss of available chlorine among various groups over time. Group IV: 2.5% sodium hypochlorite kept at room temperature, FAC calculated immediately after the solution was heated to 60°C–70°C at intervals of 30 min, 1, 3, and 6 h.
The room temperature was noted to be in the range of 28°C–30°C when the study was conducted. The sodium hypochlorite was heated to 60°C–70°C in a covered beaker using a Bunsen burner, and temperature was determined by a thermometer. A temperature range (60°C–70°C) was used instead of a particular temperature as accurate temperature control devices are unlikely to be available in a clinical scenario. The percentage of available chlorine was measured by iodometric (redox) titration, which involved the conversion of the hypochlorite ion (ClO –) to iodine (I2) by the addition of KI and then titration of the iodine with standardized sodium thiosulfate solution. The measurements were carried out in triplicate for each sample, and the mean value determined. The pH of the samples was recorded with a digital pH meter at the end of 30 min, 1, 3, and 6 h from the time of dilution. Two readings were obtained, and the mean values were calculated. The data were entered into IBM Statistics for Windows (Version 20; IBM Corp, Armonk, NY, USA). The variations in FAC among the groups over time were compared using one-way analysis of variance (ANOVA) with post hoc Tukey test. Differences in pH among the groups were compared using independent t-test. The FAC concentration of the control group was adjusted to 2.5%, and the pH was 11.68. All samples showed a reduction in FAC when compared to the control group over time, irrespective of the storage temperature. The loss of chlorine content in Group I when compared to the control group after 30 min of dilution was 7%, 10% after 1 h, and 22% and 35% at 3 and 6 h, respectively. Group II recorded the maximum reduction in chlorine titer. Available chlorine decreased by 14% after 30 min and further by 18%, 42%, and 53% after 1, 3, and 6 h, respectively. Group III showed minimal loss of available chlorine. There was a 6% fall in chlorine titer at 30 min of dilution, 8% at 1 h, and 17% and 28% at 3 and 6 h, respectively. 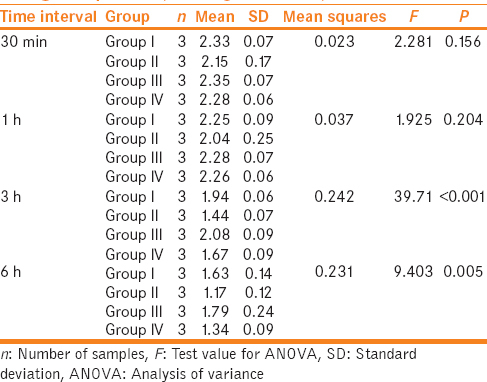 Group IV showed 9% depletion of the initial value at 30 min of dilution, 10% at 1 h, 33% at 3 h, and 46% at 6 h. Comparison using one-way ANOVA test showed that FAC is highest in Group III followed by Group I, Group IV, and least in Group II [Table 1] and [Figure 1]. Post hoc Tukey test showed that there was no significant statistical difference between any of the groups at 30 min and 1 h of dilution. 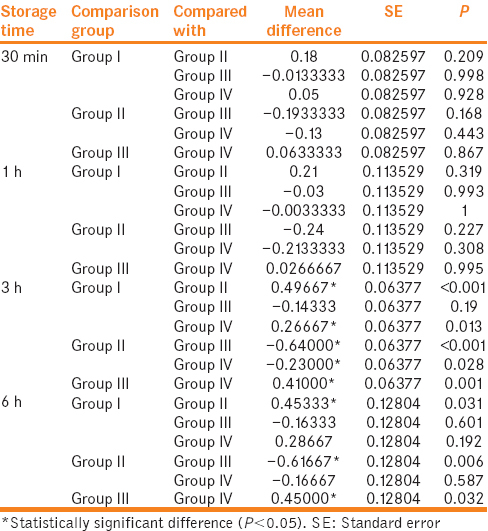 At 3 h, there was a statistically significant difference between all the groups, except between Group I and III. Comparison of available chlorine at 6 h showed that there was a statistically significant difference between Groups I and II, II and III, and III and IV [Table 2]. 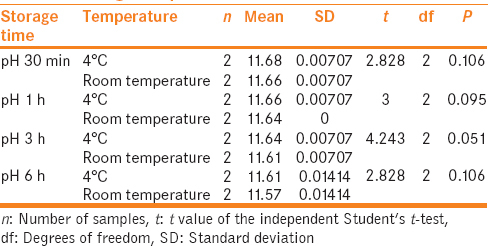 Although there was no statistically significant difference in pH among all the groups, at all times (P > 0.05), it could be observed that the pH was slightly higher in samples stored at 4°C than at room temperature at any given time [Table 3] and [Figure 2]. The results of the current study support the common impression that sodium hypochlorite solutions are inherently unstable after dilution and are to be used within 3 h of opening the sealed bottle and diluting when intended for endodontic irrigation purposes. Frais et al. noted that pH and concentration of the solution, temperature, ultraviolet light exposure, and presence of trace ions play an important role in the decomposition of the hypochlorite ions to chlorate (ClO 3–) and chlorine (Cl –) ions. In the current study, a gradual decrease in the pH of all solutions irrespective of the storage temperature was seen over time which was proportional to the decomposition rate of the solutions. However, the decomposition rate in this study can be said to be independent of pH value as it was noted to be above 11 at all times, and the drop in pH was not statistically significant in any of the groups. A similar study by Piskin and Türkün  compared various brands of commercial bleach as a source of sodium hypochlorite as a source of sodium hypochlorite. In their study, they concluded that the pH of the solutions used in their study did not affect the stability; however, storage temperature and concentration of the solutions were said to have significant effects on the degradation rate. The FAC is the total of HOCl – and OCl – concentration in the solution. These molecules are responsible for the chlorinating and oxidizing action on pulp tissue and microorganisms. The FAC was measured using an iodometric titration method according to Piskin and Türkün  and Frais et al. All groups illustrated a negative correlation between the FAC and time. The dilution of sodium hypochlorite resulted in the loss of available chlorine that was not statistically significant up to 3 h. Solutions kept at room temperature showed maximum loss of available chlorine. This finding is consistent with research done previously by investigators that reported a gradual decline in available chlorine over time. Based on the report of our study, storage temperature is a crucial factor in the stability of sodium hypochlorite solutions. Solutions stored at 4°C showed a remarkably higher concentration of available chlorine than those kept at room temperature. The fall in FAC is almost 1.5–2 times more in solutions stored at room temperature than those stored at 4°C at the end of 6 h. This is in accordance with studies conducted by Piskin and Türkün  and Hoffman et al. which reported storage of sodium hypochlorite at 4°C kept the solutions stable for a longer period of time. The content of FAC in sodium hypochlorite solution after heating for endodontic irrigation has not been researched thoroughly. Certain studies have reported that heating was more efficacious in tissue debridement., Other studies demonstrated that the capability of 1% sodium hypochlorite at 45°C to dissolve human pulps was similar to 5.25% solution at 20°C, and a temperature rise of 25°C increased sodium hypochlorite efficacy on steady-state Enterococcus faecalis cells by a factor 100. The bactericidal activity is more than doubled for every 5° increase in temperature in the range of 5°C–60°C. In the present study, results show that there was no statistically significant difference in available chlorine versus time between the heated and nonheated solutions at 30 min and 1 h. This is in consistence with experiments carried out by Gambarini et al. which demonstrated both heated and nonheated solutions maintained high available chlorine content and pH values consistent with excellent tissue-dissolving and antibacterial properties. On the other hand, this is in opposition to the study done by Cunningham and Balekjian  which reported that there was degradation of heated samples at 24 h when tested at 37°C. In the current study, a statistically significant difference was seen between Groups I and IV at III h, wherein the chlorine titer was higher in the former. It was also noted that the available chlorine was higher in Group I than in Group IV although the difference was not statistically relevant. This may have occurred due to a difference in storage temperatures; Group I samples were stored at 4°C and Group IV samples at room temperature. Frais et al. conducted an experiment to evaluate various factors affecting the FAC concentration. They heated 5.25% samples of sodium hypochlorite in covered and uncovered beakers at 70°C–75°C for up to 4 h. The available chlorine titer was measured at hourly intervals. Results obviously showed a higher concentration of available chlorine in samples that were heated for a longer period of time in uncovered beakers due to evaporation. In the current study, the use of heated sodium hypochlorite solution that was stored at 4°C shows good stability even at 6 h. Therefore, the use of warm sodium hypochlorite is safer than using nonheated, higher concentrated ones. However, the effect of warm sodium hypochlorite on periapical tissues remains controversial, and further investigation on this has to be documented. pH of the samples did not affect the stability of sodium hypochlorite in this study. Our sincere thanks and appreciation to Mr. B. Rajgopal Bhat, Head of Department of Chemistry, St. Aloysius College, Mangalore, India, for his guidance and constant supervision and permitting the use of laboratory and providing necessary materials and instruments. Piskin B, Türkün M. Stability of various sodium hypochlorite solutions. J Endod 1995;21:253-5. Estrela C, Estrela CR, Barbin EL, Spanó JC, Marchesan MA, Pécora JD. Mechanism of action of sodium hypochlorite. Braz Dent J 2002;13:113-7. Kandaswamy D, Venkateshbabu N. Root canal irrigants. J Conserv Dent 2010;13:256-64. Johnson BR, Remeikis NA. Effective shelf-life of prepared sodium hypochlorite solution. J Endod 1993;19:40-3.
van der Waal SV, van Dusseldorp NE, de Soet JJ. An evaluation of the accuracy of labeling of percent sodium hypochlorite on various commercial and professional sources: Is sodium hypochlorite from these sources equally suitable for endodontic irrigation? J Endod 2014;40:2049-52. Shetty KP, Satish SV, Kilaru K, Ponangi KC, Venumuddala VR, Ratnakar P. Comparative evaluation of the cytotoxicity of 5.25% sodium hypochlorite, 2% chlorhexidine and mixture of a tetracycline isomer, an acid and a detergent on human red blood corpuscles: An in-vitro study. Saudi Endod J 2014;4:1-6. Marion JJC, Manhães FC, Bajo H, Duque TM. Efficiency of different concentrations of sodium hypochlorite during endodontic treatment. Dental Press Endod 2012;2:32-7. Frais S, Ng YL, Gulabivala K. Some factors affecting the concentration of available chlorine in commercial sources of sodium hypochlorite. Int Endod J 2001;34:206-15. Hoffmann PN, Death JE, Coates D. The stability of sodium hypochlorite solutions. In: Collins CH, Allwood MC, Bloomfield SF, Fox A, eds. Disinfectants: Their Use and Evaluation of Effectiveness. London: Academic Press; 1981. p. 77-83. Sirtes G, Waltimo T, Schaetzle M, Zehnder M. The effects of temperature on sodium hypochlorite short-term stability, pulp dissolution capacity, and antimicrobial efficacy. J Endod 2005;31:669-71. Gambarini G, De Luca M, Gerosa R. Chemical stability of heated sodium hypochlorite endodontic irrigants. J Endod 1998;24:432-4.